Since Republican Larry Hogan was elected governor in November, transit advocates in Maryland have been holding their breath. During the campaign, Hogan threatened to kill the mostly-funded and ready-to-go Red Line in Baltimore and the Purple Line in the DC suburbs — two of the biggest transit projects on tap in the U.S.
A budget document recently released by the Hogan administration on Friday avoids the worst-case scenario of immediately abandoning both projects. Dan Reed at Greater Greater Washington reports that Hogan is setting aside $313 million for the Purple Line and $106 million for the Red Line — enough to keep the projects progressing. Hogan campaigned on a platform of reducing government spending and building roads instead of transit, so this news is a blessing for transit supporters. But the Purple and Red lines aren’t done deals yet. For the Purple Line, it’s likely that Hogan is waiting to see the bids for a public-private partnership to build and run the project. Maryland wants the private partner to provide between $500 and $900 million, but if the bid is too low and the state has to provide more money than Hogan’s budgeted, then the Purple Line may be in trouble. The bids are due March 12. If Hogan does decide to pull the plug on the Purple Line (or the Red Line) before those projects get underway, the amount he’s budgeted in FY 2016 would go unspent, and the MTA budget would likely be lower in future fiscal years as a result. Hogan’s actions could prompt the state legislature to allow Montgomery and Prince George’s counties to tax themselves to help pay for the Purple Line. However, Montgomery County had already envisioned taxing districts as a way to pay for its proposed bus rapid transit network, and voters may be unwilling to accept a tax increase large enough to pay for two big transit projects at the same time. Some funding issues will have to be ironed out for the $2.9 billion Red Line, as well. Elsewhere on the Network today: The Political Environment relays one Milwaukee alderman’s absurd prediction that the city’s streetcar will lead to “shootings, assaults and rapes.” ATLUrbanist discusses the potential for walkable development near the Atlanta streetcar. And Family Friendly Cities reports that even after a round of school reforms, families are leaving Washington, DC, at roughly the same rate they did in the past. The story about families leaving DC leaves unspoken a key point: that despite years of school reform presumably intended to improve schools, the schools didn’t actually improve. So it’s not surprising families are still leaving. The fact that they’re leaving doesn’t show that improving schools couldn’t make more families stay–but (since educational outcomes are largely determined by the social class of the student population) it may show that you have to make families stay before the schools will improve. My hope is that the bids are more competitive with the uncertainty in mind. The state might get a better deal and hopefully Hogan allows for the project to go forward. Maryland needs both of these projects to stay competitive with other east coast communities that are transit accsisble. The decades-long saga of the Maryland Purple Line reached a happy milestone yesterday. 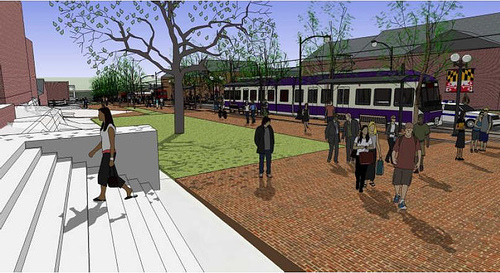 Will Maryland Gov-Elect Larry Hogan Kill the Red and Purple Lines?